Thank you, thank you, thank you to everyone who has left a comment or has visited recently. I was completely overwhelmed when I saw that I had 24 comments on Sunday's post. Now, I realize that for most people, 24 comments is a low number, but the highest I have ever had was 9. I am still rather new to blogging but I can honestly say that I have been grinning from ear to ear all week! Thank you to everyone for your wonderful comments. I have been trying to respond to everyone, but I am not sure that the emails sent properly. I am still trying to figure out how exactly to respond to email notification comments. If you did not get an email, I am sorry! I might just try and post the emails as comments but please know that I did "respond!" Most of you sympathized with my queen stitch dilemma, but some of you said that you enjoyed queen stitches. So, I guess there is hope! One of my fellow Richmond Sampler classmates even found me a left a lovely comment. Thank you, Susan! I hope to see you back here soon...and yes, you will see me next year at the Gathering! I have been very busy this week with work and school. I had class today for EIGHT HOURS! However, when there are a few free moments I am happily stitching on Richmond Sampler. I stitched part of the border outline and figured that I had better start on the dreaded queen stitches. At night when I was trying to sleep, when I was driving, and even when I was teaching, I was envisioning how I would stitch a queen stitch. I kept visualizing until I felt that I could comfortably stitch a queenie and then Monday I just did it. I stitched nine whole queenies! I was so proud and they were so pretty...but boy did they take some time! There is a real postitive to stitching queenies though, I don't really need a chart. Once I make the outline, I can take my linen, some thread, plant myself on the couch and stitch away. That is what I am really liking about queenies! Honestly, if it were not for everyone encouraging me that I could master queen stitches, I would have taken the easy road and just stitched cross stitches instead. Thank you for your encouragement...these queen stitches are for you! I scanned the piece hoping to get a better view of the queenies...not sure that it worked. Anyway, the inside of the border and part of the flower basket are queenies. Here is a picture of what I have gotten done so far. If you want a closer view, just click on the picture and you should be able to see the stitches better...the border is going to be gorgeous! Richmond Sampler has been the apple of my eye lately but I should really pick up Psalm 23 soon. I had hoped to get it done by the end of February, so now I guess I will shoot for March. I have been stitching on and off for many years but in the past have only worked on one thing at a time. Lately, I have decided to get a rotation going, however, I feel like I have stitching Attention Deficit Disorder. I guess that I should not stress about it especially since stitching is my stress reliever! What does everyone else do? Any ideas? Is there a cure for stitching ADD? Well, I guess I should scuttle off and finish my weekly assignments. I only have 9 more weeks to go and then I will be finished with these assignments...thank goodness. I have learned a lot through this teaching licensure program and I would not trade it for the world, but I will not miss having to write three research papers a week. Besides, it takes up my precious stitching time! Till next time everyone...Happy Stitching! OMG! This piece is just stunning! And what a lot of queen stitches! But boy, is the result worth the effort! Valerie, it's just wonderful! Awesome progress on your Richmond Sampler! Good for you, Valerie, on those queen stitches! They look terrific! Woo hoo on the queenies! They truly are beautiful, and good for you for not exchanging them for x-stitches. I'm really enjoying seeing you do RS. I know what you mean about the research papers; I'm sitting here reading needlework blogs when I should be doing a paper. I keep telling myself to hurry up and finish the paper so I can stitch with a clear conscience tomorrow. Oh, and I'll bet there will be more than one of us joining you at the Gathering next year (me for one, if I can do it). Great stitching. Good luck with the Queenies. Good for you! And look how beutiful your sampler is with the Queen stitches. You did good - no great! Good news on the Queen Stitches! I wish I've reached the point of conquering them instead of running in the opposite direction when I see there are some to do!! 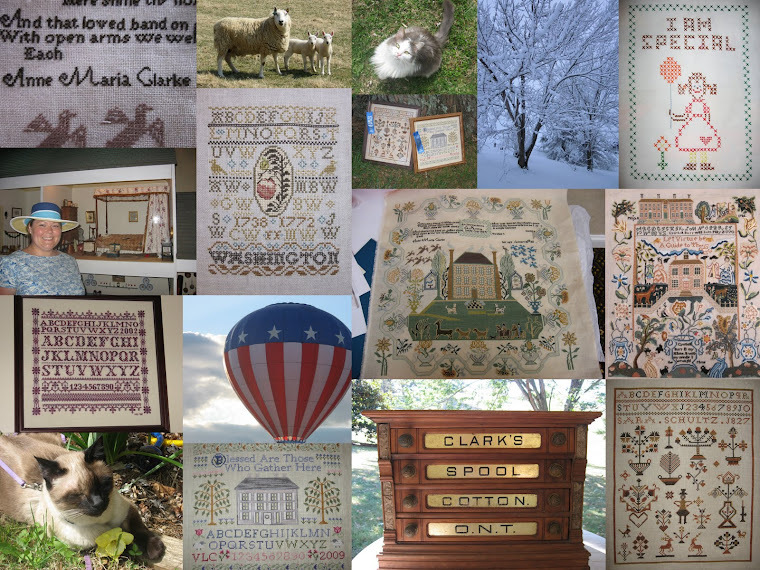 Your Richmond Sampler is gorgeous! Sounds like you've been really busy with classes. Your Queen stitches look fantastic! You're making such good progress and your sampler is very pretty - great work! Your stitching really is gorgeous and I am so enjoying watching your progress on this piece. It's a stunning sampler. I tend to just go with the flow and stitch on what's calling the loudest. I am not at all good at rotations :-). The best I can do is limit myself to three or four projects but I don't have a schedule of which ones I stitch when. Oh my gosh, Valerie! Your queen stitches look awesome and they really will make the sampler special! I love it! And yes, we all have some degree of stitching ADD - I happen to have crafting ADD. I go into my craft room sometimes and can't decide what to do so end up just sitting there and do nothing. That's bad! Good luck on the last 9 weeks! I'm so glad that we've encouraged you to stick with the 'queenies'. Your stitching is beautiful and the sampler is a beauty too. I'm going to enjoy watching your progress. Hi Valerie! I just stumbled upon your blog from a link on another one. Your trip to Wmsbrg sounded like a lot of fun. I live near Wmsbrg and have been to Haus Tirol many times. You're right, the ladies there are so nice. I love the Richmond Sampler. You're coming along nicely on it. As for stitching ADD, I definitely have it along with quilting ADD and scrapbooking ADD, and let me not forget cleaning ADD. It's hard to cure, lol! Your queen stitches are looking amazing! This sampler is going to be an absolutely beauty when you're finished. And you're not the only stitcher with ADD. I don't even want to tell you how many stitched projects I've got going, let alone all the quilting I want to do. And I just started rug hooking classes. I'm all over the place. But you know it's all about the journey and having fun with it!!! Kudos for staying tough and mastering those queenies! The border is really beautiful. Can't wait to see more. Your Richmond Sampler is looking absolutely gorgeous!! As are your queen stitches (I did make the picture bigger to look at the detail...beautiful!!). You have beautiful work! And it sounds like you really had a nice time at The Gathering. Yes, I also have stitching ADD. I have a large basket next to mt chair with my 'current' rotation inside, but lately EVERYTHING I buy is in the basket. I want to do it all right now! I'm so easily distracted by my pretty, shiny projects! Good luck with those classes. Not sure how I found your blog but I'm glad I did. Your Richmond Sampler is going well. I will look forward to your progress. It's funny when you mention about ADD. I tend to get overwhelmed when there's too much going on, too many choices. Since I have only 2 scroll frames, one floor, one lap, I am limited to how many projects I do at once. I usually focus on doing and finishing one at a time! Valerie, woo hoo!! Good for you with the queen stitches--you are doing great with it! I can do them but it takes me a long time, too. I am sure that by the time you're done with RS, you'll be the queen stitch master. ;) It is So pretty!! Your queen stitches look awesome!!! Definitely worth the effort and I think you've got them mastered. You'll find that the pace picks up as you do more of them. 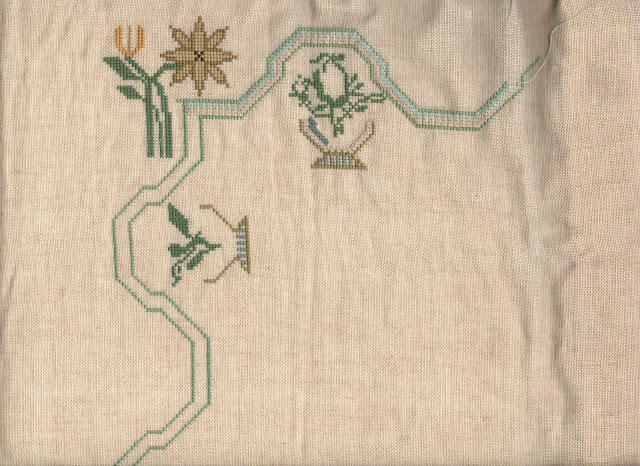 I'm contemplating starting a blog, and if I do I'll post a picture of another Essamplaire sampler that I just finished - Elizabeth Yeagers. There was a TON of queen stitch in that one! You've made more progress on Richmond than I have, I think - I have not started the queens - not because I don't like them (they are one of my favorite stitches) but I need my scroll bars before I tackle them. I just can't do them in hand and get the tension right. So, I've done 4 flowers and a bit more of the border outline. I don't have a real rotation, but I'm often jumping around from project to project - nothing wrong with that (keeps life from getting boring). When I get close to finishing something I usually get more focused and want to get it done. I can't wait to see more of your progress pics! Just wanted to let you know I think your Richmond Sampler is going to be so beautiful when you get it finished!! And, I think your queen stitches are fantistic. I would never have guessed you just started stitching them!!! Great work. This is going to be so pretty when it is done! Stitching ADD, very funny! I have nominated you for an award, come by my blog to pick it up. Sorry I am late in commenting as I haven't been well and I am slowly catching up with my blog reading. I just wanted to let you know that your Richmond Sampler is such a stunning sampler and I look forward to watching your progress. The work that you have done so far is looking wonderful. I too find that QS are so much easier if done on a hoop etc. - Sandra.